I am a huge fan of beautiful embroidery. I can't help it. It's a skill that's a part of my heritage, and one I unfortunately didn't inherit. In Facebook a while ago, I discovered something even more amazing to me than embroidery and the gorgeous creations you can make with it. That would be... beading embroidery. What can I say about this but "oh my god.. WOW!". I mean, really, if you haven't seen this amazing skill in action or the end results, you really need to. I've never seen anything so delicate and intricate and just plain gorgeous. Betty Stephan Beadworks shop on Etsy is filled with these remarkable pieces. Every tiny bead is sewn on individually, creating a beautiful long-lasting piece and the clasps on these pieces are made with the same amount of care and detail so that even those allergic to metals can wear these pieces without worry. For the past 3 years Betty Stephan has retired into a career as a jewelry designer and has been displaying and selling her beautiful jewelry at art and craft Shows throughout the Northeast. 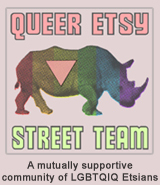 She has a variety of pieces in her shop, but if you like what you see there, I encourage you to go further and check out her website as well. YOU CAN CLICK ON THE PICTURE ABOVE TO VISIT BETTY STEPHAN'S BEADWORKS SHOP ON ETSY AND TAKE A LOOK AROUND OR, IF YOU PREFER, CLICK RIGHT HERE. 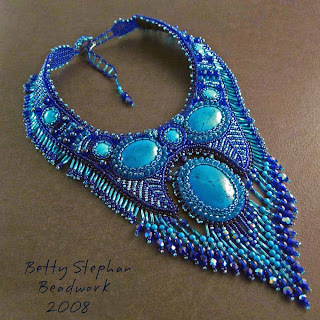 Also, as I mentioned earlier, I discovered Betty Stephan and her amazing beadwork through Facebook. This is a terrific place to stop by and see her newest creations as she finishes them!